LOS ANGELES: Kevin Durant scored 37 points as the Oklahoma City Thunder completed a 4-2 series victory over the San Antonio Spurs to advance to a Western Conference finals showdown with the Golden State Warriors on Thursday. He left the game to a standing ovation after a superb personal contribution that also included nine rebounds and two assists. “We’re not done yet,” Durant said. “We have to keep improving. Keep getting better and get ready for the next series.” The host Thunder punched their ticket to their fourth Western Conference finals in six years with a 113-99 victory in front of a crowd of 18,200 at Chesapeake Energy Arena. Oklahoma City showed that when either Durant or Westbrook get in a groove, they are tough to beat and when both get going at the same time, it’s almost impossible to stop them. “We know what we can do as a team,” Westbrook said. “We are confident in ourselves.” The Spurs had trailed by as much as 26 points at one stage in the game, but despite narrowing the gap in the fourth quarter, were always struggling to overhaul the deficit. The Thunder continued their rebounding dominance with a 50-40 advantage. They turned the ball over 12 times, while the Spurs gave the ball away just 10 times. Oklahoma City outshot San Antonio from the floor, 47 percent to 43 percent. two of San Antonio’s long-serving veterans, with Tim Duncan, 40 and Manu Ginobili, 38, in the twilight of their NBA careers. 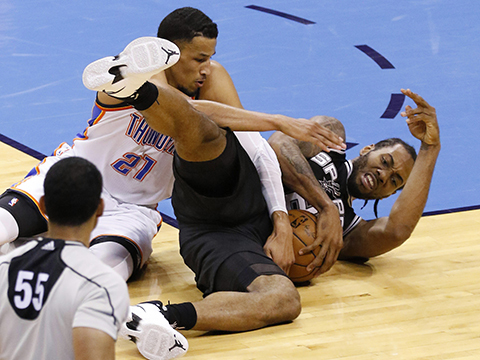 The evergreen Duncan finished with 19 points, while Kawhi Leonard was the top scorer for the Spurs with 22.